Q: Can the shirt be washed and dried like a normal polo shirt? A: Yes, the 60/40 cotton ply, or wicking material, can be washed in a gentle cycle. Tumble dry on low and warm iron if needed. Q: Why does it take up to 10 days for shipment? A: We have a small staff of highly qualified producers of quality craftsmanship to insure the durability and continuity of our patent approved product, therefore, although our shipping will most likely take place in a time frame much shorter than 10 days, we would rather quote a shipping time frame that is most certainly attainable by our staff to insure customer satisfaction. Q: How do I determine the right size for me? 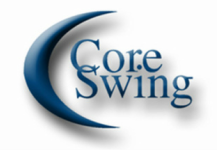 A: The Core Swing Golf Training Shirt's patented system has been manufactured to insure consistent sizing. Use the chart shown below to order with confidence. In the event your shirt does not fit properly return it and we will send you the appropriate size.